Dig in deep and experience the raw power and grit of the blues. 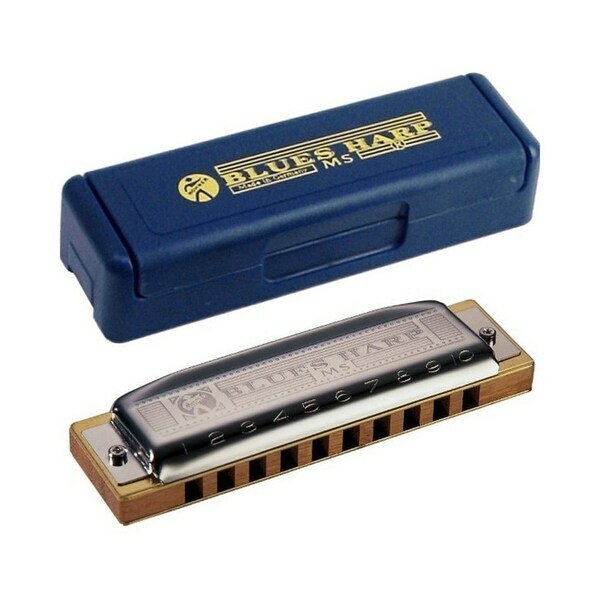 The Blues Harp is engineered for consistent volume and tone when used for intense blues playing. This harp can hang with the toughest players on their most serious gigs. Highly bendable with a dirty, dark hard rockin' sound, this harmonica is designed to emphasize all the best qualities of blues harmonica playing. It has a wood comb for full tone and is available in 12 keys. Reeds: 20 Reedplates: Brass; 0.9 mm Comb: Wood Length in cm: approx. 10.0 The harmonica that adjusts to YOU! The abbreviation "MS" stands for Modular System, an integrated concept in harmonica design. All individual MS parts (combs, reed plates and covers) can be combined and intigrated with any of the MS harmonicas. Customize your harp with features that matter to you. Simple screw connections allow for easy assembly. Screws also allow for easy access to the reed plates, giving the player the ability to adjust the instrument to their own personal requirements. Hohner's diatonic harmonicas set the industry standard through their high quality construction, excellent response and unsurpassed tone. Often called "Blues Harps", they have been a fixture as melody and accompaniment instruments in blues, rock, country, and folk bands, as well as many other styles of music and musical ensembles. Richter tuning and undivided air channels allow for bending and overblowing the reeds, creating the signature wailing sound typical of the harmonica.